Lighting is the element that will make your images go from nice to stunning. We ADORE golden hour for romantic portraits and we try to build a timeline that allow us to have plenty of time during sunset. In addition if it is at all possible to get ready in a room or area that has abundant natural light or a nice big window, that is the best case scenario. Dark rooms make photos difficult and less beautiful. Sometimes we suggest to have get ready photos taken outdoor instead of dark and small rooms. We wish couples knew ‘wedding time’ is not the same as regular time. When you think you have a half hour for photos, you really only have 15 minutes. Weddings are very fluid, and time just seems to sneak away. Time is the hardest thing to come by on your wedding day. Always leave plenty of wiggle room, and consult with your photographer about their needs for time so you get the images you hired them for. When we build a timeline we add some cushion time every now and then so we have some wiggle room to work with. Convey your photographic desires with other vendors so we are all on the same page. We try to communicate with all other vendors, but having the bride and groom follow up confirms the importance. In our experience we buit some special relationship with a lot of wedding vendors and we took place in amazing team effort! Always take advantage of doing an engagement session! 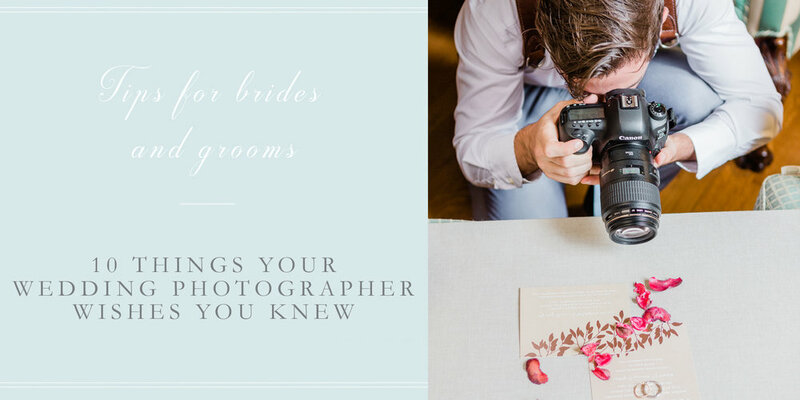 This enables you to become familiar with the style, approach and personality of your photographer, and will aid in making your wedding day that much more relaxed, fun and meaningful. The wedding day will be a reunion with an old friend! We wish our couples knew that the photography timeline of the wedding day is usually what dictates the schedule for the whole wedding day (make-up, getting ready, family portraits, ceremony time, cocktail hour), and it is best to talk about early on in the planning process. One thing that is super important is meeting (or Skype) before the wedding, even if it's not for engagement photos. It makes us feel less like a vendor and more like a friend, which in turn relaxes the whole day! All of our couples became fast friends af us and we often share more than the wedding day. We shared dinners, parties and even holidays together! Ask questions, don't be shy. An open line of communication is fundamental for smooth photography coverage. Let us know if someone in the family doesn't get along with others or if there is a special dish you want to have photos of. If you need help or advices before the big day just ask! Get to know the company on a personal level before committing. So many couples think it is not possible to get to know a company on that level, but they may be talking to the wrong ones. Check photographer’s website “AboutUs” page to discover fun facts about your wedding photographer. The passionate photographer is the photographer who will not only go above and beyond for you on your wedding day, but will listen and try to capture each and every moment with purpose.